If you want to take a step back from the mega-clubs filling The Strip and enjoy a more intimate experience, Blush is the perfect place. Like its namesake makeup product, Blush is compact, soft around the edges, and tucked away neatly in a corner of the Wynn’s “purse”. 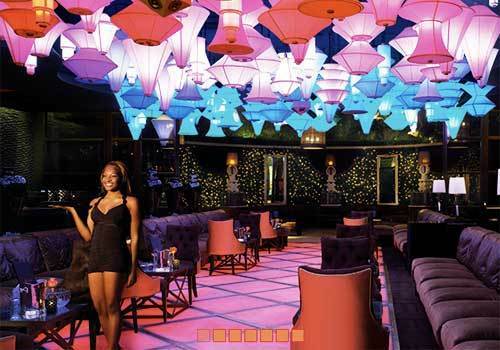 Blush Las Vegas calls itself a “boutique” nightclub, holding just 400 people. The small size gives the club a vibe of exclusivity; it also means you won’t get lost in a mega-crowd, so you’re likely to make some new friends. Despite its size, Blush packs a lot of class into a small package. 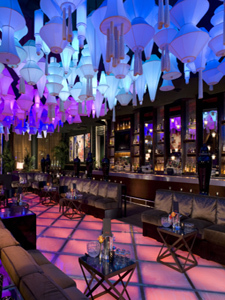 300 color-changing paper lanterns hang from the ceiling to give the club a warm, stylish atmosphere. The back of the club is a large open air patio, a great place to catch your breath from dancing and enjoy the warm desert air. Though Blush is very high class, drinks are still affordable, giving you the best of both worlds. Tons of cool events including celebrity appearances and a weekly industry night keep this place crowded most nights of the week, so beautiful people are everywhere. Why not be one of them? Blush Nightclub may have closed its doors, but you can still get on the Intrigue Nightclub Las Vegas guest list and continue to party at the Wynn! Attire / Dress Code: Stylish nightlife, strictly enforced. Recommend dark shoes and collared shirt for men; Ed Hardy style acceptable. No baggy clothing, hats, sandals, shorts, or athletic footwear (management reserves all rights). Thursday, Friday, Saturday: The club opens at 9:00 but doesn't start to fill up till 11:30-12:00. We recommend getting there early to stake out a good spot as space is limited in "boutique" clubs. Since Blush has so many cool events, the small venue is often packed. Skipping the main General Admission line is nearly a must if you want to spend a nice chunk of time in the club. Our Blush Guest List get your entire party in for free and you’ll skip the General Admission line. Ladies will also get free drinks every night! Check out the links below to get started. I am so glad I found your website Chris! Blush was amaaazing. The vip treatment was sick! My girls kept asking how this was possible. Thanks for making it a memorable first trip for me. I will def be calling you next time.